Plant-based foods are one of the best sources of antioxidants, which can lower your cholesterol and reduce your risk of heart disease, cancer and other diseases. Edamame and mango are delicious low-calorie fruits which are high in fiber, sources of vitamins K, A and C, and are good examples of antioxidants. This tasty Pickled Chili Lime Mango with Edamame, Arugula, Red Onion Salad and Cilantro Rice is filled with antioxidants and is a healthy side dish the entire family will enjoy. The dish was served on Saturday, Nov. 10, at the Seed Food & Wine Festival as one of the featured recipes. In a bowl, combine the ­­­lime juice, apple cider vinegar, sriracha, salt and chili powder. Whisk well to full mix all ingredients. Add peeled and thinly sliced mango. Set aside. In a blender, add the onion, garlic, salt, pepper and cilantro and water. Pulse until paste forms. Once rice is done cooking, add the paste to the rice and mix well until the color is green throughout. In a bowl combine arugula, red onions, red pepper and sprinkle on red wine vinegar, olive oil, salt and pepper. Lastly, add edamame and toss to combine. To serve, use the cilantro rice as a base, scoop a generous amount of the pickled mango and place on top of the rice and add the serving of salad on the side. Nutritional information (per serving): Calories 373, Total fat 9g, Sodium 327 mg, Total carbohydrates 62g, Fiber 8g, Protein 11g. Rod Knight is executive chef at West Kendall Baptist Hospital. In Chef Rod’s kitchen, “clean eating” and “farm to fork” are not simply catch phrases. He is committed to offering plant-based meals and better-for-you protein options that never compromise flavor. He and his skilled team craft the patient menu choices, Wellness Meals and weekly specials from scratch using the freshest, highest-quality ingredients. While at West Kendall Baptist Hospital, Chef Rod has collaborated with the hospital’s culinary ambassador, Chef Adrianne Calvo, as well as teams from Baptist Health Wellness and Homestead Hospital’s Grow2Heal community garden to identify new ways to improve quality of life with food. He also shares his healthy food philosophy and recipes with the community through lectures, cooking demonstrations, press events and blogs. 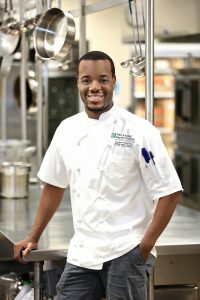 Chef Rod’s passion for delicious food that fosters wellness aligns with West Kendall Baptist Hospital’s goal to help our community become the healthiest in Florida.